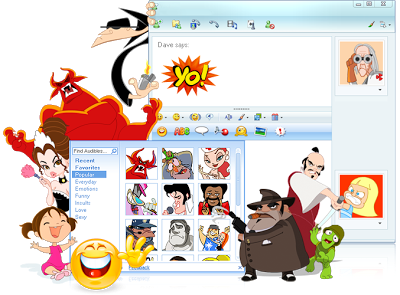 "HiYo" is an add-on for AOL, Windows Live or Yahoo Messenger and provides animated emoticons, figures and documents prepared, which can be integrated into any Messenger message. Winks change the conversation window and paste it outside the same characters that react to mouse movements. Text effect add normal text color, glitter effects or animation. Animated display pictures replace the sender field of each user by figures that respond interactively to mouse movements. About the feedback feature, users can suggest ideas for other effects that can be integrated as far as possible in future versions. The language of "HiYo" only be carried so far is English, support for other languages ​​is planned for the future. There are problems with the implementation of "HiYo" with the Flash version 9.0.115.0 released. The download of the latest version of Flash can help. It also works "HiYo" together with all other messenger add-ons. Under certain circumstances it may be necessary to remove other add-ons before "HiYo" can be used. Embody who enjoys it, Messenger messages with entertaining visual effects, which is likely to make "HiYo" much joy. The selection of animations and effects is huge, sometimes very original and implemented complex.